Our two opticians, Michael Hill and Aaron Jones are available in the office during our regular scheduled hours, including Monday and Wednesday evenings. Our two opticians have combined experience of over 40 years. Patients receive top quality individual attention from our A.B.O. certified opticians. 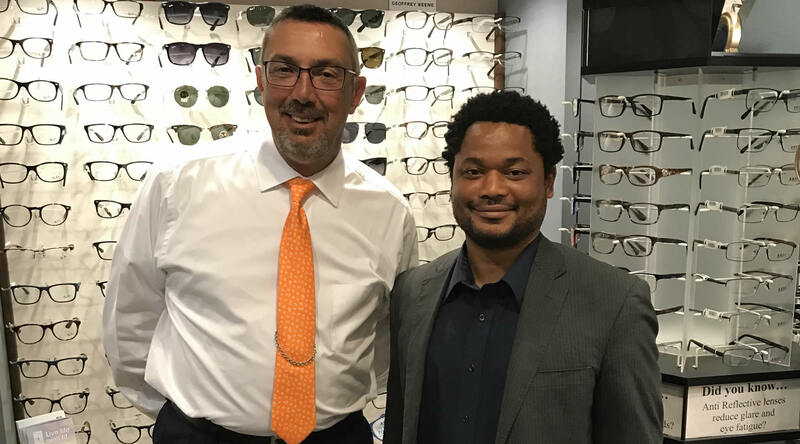 Michael and Aaron will help transform your prescription into the ideal glasses for optimum vision and advise you on the finest lenses and options available. Our Optical Shop provides the very best products for your eye care needs. We feature Crizal Anti-Reflective coatings (the best in the industry), Hi-Index plastic (super thin lenses), Polycarbonate lenses (impact resistant), Progressive Lenses and Photochromic lenses, including varilux and transitions. We have an extensive inventory of eyeglasses for you to choose from in all budgets and styles, including titanium frames, rimless styles and everything from traditional to modern designs. In addition, if you have a favorite frame that you would like to keep, we can make them into a second set of glasses or sunglasses! Please note, we are unable to measure PD's for glasses purchased on the internet. Eyeglass adjustments and most repairs can be performed on the spot. Eyeglass adjustments are always free of charge. 100% satisfaction guaranteed - Our doctors and opticians personally ensure your complete satisfaction-GUARANTEED. Price Protection Guarantee - We will match competitor pricing, we will equal it or better it-GUARANTEED. Best Selection - We feature today's top designers like Kate Spade, RayBan, Coach, Ted Baker, Vogue, and Silhouette. We offer sunglasses by RayBan, Prada, DKNY, Ralph Lauren, and D&G. Quality Craftsmanship – Your eyewear is custom made in a state-of-the-art lab. There is a “Double-Check” quality system that assures your prescription is accurate every time. Specialty Eyewear - children’s eyewear, sport goggles, sunglasses, swim goggles, eyewear for every need. Maui Jim - We are a certified dispenser of Maui Jim sunglasses, come in for a free demo.